Accusumps are oil reservoirs that connect to the engine's oiling system. They are designed collect pressurized oil from your engine and store it so it may be discharge when oil pressure is low. 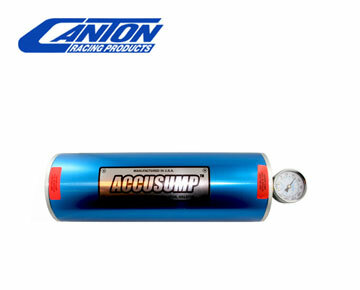 Accusump Oil Accumulators deliver oil before starting to eliminate dry start scuffing (pre-oiling) and discharge oil during low oil pressure surges to protect against engine damage during demanding racing conditions. Accusump Turbo-Oilers deliver oil to turbos after shut down to lubricate and cool hot turbo components and prevent coke build up and turbo damage.